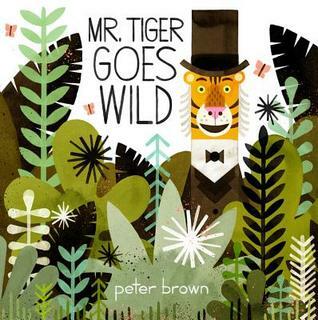 Something about the cover of Mr. Tiger Goes Wild by Peter Brown (Little, Brown; 2013) reminded me of Henri Rousseau: maybe it was the top-hatted Mr. Tiger himself, or the oversized leaf shapes that make up the jungle surrounding him. Rousseau aside, Brown won a 2013 Caldecott Honor for Creepy Carrots (by Aaron Reynolds; Simon and Schuster, 2012) and seems like a really nice guy (I know this because he signed a poster for my daughter at BEA a couple of years ago), so I requested a review copy of Mr. Tiger Goes Wild--thank you, folks at Little, Brown! Here's the story: Mr. Tiger is bored of being a prim and proper anthropomorphized animal. He wants to be...wild (he's a tiger, after all). It's the perfect premise for a picture book, and Brown delivers, depicting Mr. Tiger's transformation in two gorgeous, graphic (ahem) spreads. I don't want to give away the page turns--they make the book as far as I'm concerned--but someone in the publicity department at Little, Brown might want to mock up a poster. Odds and endpapers: The illustrations for Mr. Tiger Goes Wild were "made with India ink, watercolor, gouache, and pencil on paper, then digitally composited and colored" (from About This Book); they remind me a little of Jon Klassen's work in the 2013 Caldecott Medal winner This is Not My Hat (Candlewick, 2012), actually. Bonus points for the illustrated endpapers and textured tiger-striped cover underneath the dust jacket, though. And for Mr. Tiger--roar! Available tomorrow.